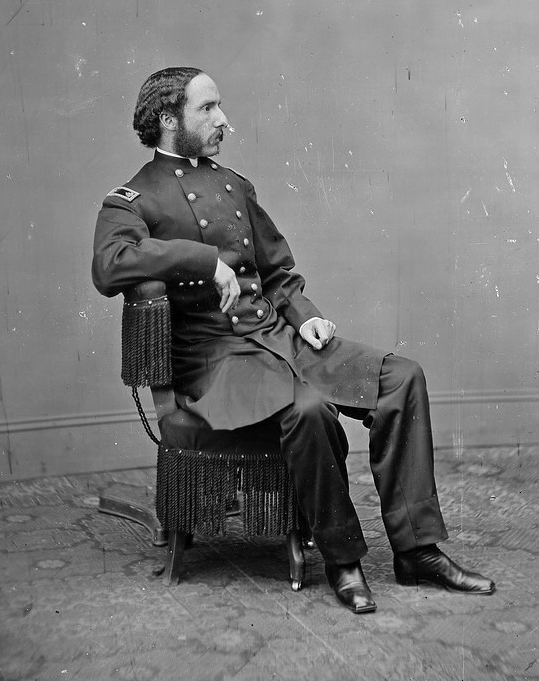 With the explosive crack of the assassin’s Derringer pistol, Major Henry Rathbone jumped to his feet in an effort to detain J. Wilkes Booth in the Presidential box at Ford’s Theater. Booth, in his struggle to get away, pulled his dagger and stabbed Major Rathbone in the right arm before jumping over the balcony railing and onto the theater stage below, yelling and waving his dagger wildly as he made his escape into the night. Through the actions of a deranged madman on April 14, 1865, Major Henry Rathbone was thrust into the spotlight of American history. Certainly Henry Rathbone had thought by April 9, 1865, the day Confederate General Robert E. Lee surrendered to Union General Ulysses S. Grant at Appomattox Courthouse in Virginia, he would survive the war. This was a major achievement given Henry Reed Rathbone was a fighting member of the 12th U.S. Infantry, a regiment that had seen heavy action in twelve eastern battles including Gaines’ Mill, Antietam, Fredericksburg, Gettysburg and Weldon Railroad, and had suffered significant casualties as a member of the Army of the Potomac during the war. And now the Major, wounded and bleeding, tried frantically to get the barricaded door open to the Presidential suite as the President of the United States lay dying. President Lincoln would die of his mortal wound a few hours later, on April 15, 1865. Major Rathbone would be treated for his non-life threatening wound and would begin to answer questions all Americans were asking, like who was Major Henry Rathbone? And, what happened in President Lincoln’s suite at Ford’s Theater? Dubuque Democratic Herald – April 18, 1865. Henry Reed Rathbone of Albany, New York was a Major in the 12th U.S. Volunteer Infantry that originated out of Fort Hamilton in New York Harbor. Upon joining the 12th U.S. Infantry in May of 1861, Captain Henry Rathbone was immediately assigned to recruiting services and remained on recruiting duty until March of 1862. The 12th U.S. Infantry had recruiting offices in different cities across the northern part of the United States at the start of the Civil War, including an official recruiting office in Dubuque, Iowa. The city of Dubuque was teeming with recruiting offices the first two years of the Civil War in 1861 and 1862. Dubuque was a natural rendezvous point for men from Northern Iowa, Wisconsin, Minnesota and Northern Illinois seeking adventure in the Army because of its location to two vital transportation networks. Dubuque, Iowa was one of the largest cities along the Mississippi River between St. Louis, Missouri and St. Paul, Minnesota and it was at a major intersection for steamboating and the railroads of the Northwest. Recruiting offices sprung up around Dubuque, starting in April of 1861, to raise men to answer President Lincoln’s call for soldiers to put down the rebellion. Camp Union was built at Eagle Point to drill, quarter and muster into military service the men pouring into the city to join one of the Iowa regiments being organized in Dubuque by order of Iowa Governor Samuel Kirkwood. In 1861, Dubuque’s Camp Union was the regimental headquarters and mustering center for the 9th & 12th Iowa Infantry and the 3rd Iowa Light Artillery. Recruiting offices were established in the city of Dubuque and raised Companies for the 1st, 3rd, and 7th Iowa Infantry, the 1st Iowa Light Artillery and the 1st, 5th and 7th Iowa Cavalry, which all had regimental headquarters in other Iowa cities. In 1862, Dubuque’s Camp Franklin, renamed from Camp Union, was the regimental headquarters and mustering center for the 21st, 27th, 32nd and 38th Iowa Infantry. Recruiting offices were established in the city of Dubuque and raised Companies for the 16th, 37th, 42nd, 44th and 46th Iowa Infantry, which all had regimental headquarters in other Iowa cities. Recruiting offices were also set up in Dubuque for out of state regiments and for U.S. Volunteer Infantry regiments. The 11th Pennsylvania Cavalry raised Company A in Dubuque. The 3rd Missouri and the 29th Illinois Infantry also raised companies in Dubuque. The Federal Army recruited men through Dubuque as well. The 12th, 13th, 16th and 19th U.S. Infantry all had recruiters and recruiting offices operating in Dubuque in the first couple of years of the war. The 13th U.S. Volunteer Infantry was very successful recruiting in Dubuque and raised several hundred soldiers through their Dubuque office. The 13th U.S. Infantry was organized in 1861 with William Tecumseh Sherman as its Colonel and Philip Sheridan as one of its senior Captains. Captain E.C. Washington and Lieutenant John M. Duffy were recruiting officers for the 13th U.S. Infantry Dubuque office. Captain Washington would also perform the honors of mustering into service numerous Iowa regiments and/or companies being organized and mustered into service at Dubuque’s Camp Union in 1861 and Camp Franklin in 1862. The 12th U.S. Infantry was organized by decree of President Lincoln on May 4, 1861. The regiment was organized at Fort Hamilton in New York Harbor. William B. Franklin of Pennsylvania was the regiment’s organizing Colonel. Henry Reed Rathbone joined the 12th U.S. Infantry with his Class of 1857 Union College classmate Samuel S. Newbury of Detroit, Michigan on May 14, 1861. Captain Rathbone and 1st Lieutenant Newbury began their service in the Twelfth as regimental recruiting officers. They joined fellow Union College alumni Daniel Butterfield, Class of 1849, who was the 12th U.S. Infantry organizing Lieutenant Colonel. Butterfield would go on to create the enduring military bugle call known as “Butterfield’s Lullaby”, formally known as “Taps”, in 1862. Upon the organization of the Officer’s Corps for the 12th U.S. Infantry, it was decided that recruitment would be handled by sending the regimental Captains, along with their Lieutenants, to their home states to recruit men for Companies they would then lead. Regimental Captains were from New York, Pennsylvania and Ohio, as well as Indiana, Illinois and Minnesota. 1st Lieutenant Newbury was paired with Captain Thomas M. Anderson of Ohio. Captain Anderson was the nephew of Major Robert Anderson of Fort Sumter fame. It was decided by the regimental command that Captain Anderson would recruit in his home state of Ohio, and Lieutenant Newbury, who was listed as being from Detroit, was assigned to recruit in Wisconsin, in the Northwest. The 12th U.S. Infantry ultimately chose Dubuque, Iowa to be the center for their recruiting office in the Northwest. 1st Lieut. Samuel Newbury would be the officer in charge of the recruiting office, located at Main and Third Streets in Dubuque. Although Newbury was not from Dubuque, it was a homecoming of sorts for the young Lieutenant. Newbury’s father, Reverend Samuel Newbury had moved his family to Dubuque nearly a decade earlier. Reverend Newbury was a Presbyterian minister and missionary originally from Vermont who ministered around the United States. Newbury moved to Dubuque in 1853. Mary Newbury Adams, the minister’s daughter and the young Lieutenant’s sister, was married to the prominent Dubuque attorney Austin Adams; a relative of the Revolutionary Samuel Adams. 2nd Lieutenant W.W. Dewey, from Fort Hamilton, was also in Dubuque recruiting along with 1st Lieut. Newbury. The 12th U.S. Infantry mustered over two hundred soldiers into service through Dubuque in 1861-62. This was a large number of soldiers and the majority were recruited by a local enlisted soldier, Private James Jackson, who had moved to Dubuque in the 1850s. Jackson would quickly rise through the ranks and spend a career in military service, eventually retiring from the U. S. Army as a Lieutenant Colonel with a Congressional Medal of Honor for his gallantry against the Nez Perce in 1877. Samuel Newbury’s connections to Dubuque extended even further, through his time at Union College. Rathbone and Newbury were members of the Class of 1857 at Union College in Schenectady, New York. Joining them at Union College were fellow classmates Franc Wilkie of West Charleston, New York in the Class of 1857 and Alexander Simplot of Dubuque, Iowa in the Class of 1858. Both Wilkie and Simplot were living in Dubuque at the start of the Civil War in 1861 and were part of the news corps “Bohemian Brigade” that followed General Grant’s army around the Western Theater in 1861 and 1862; reporting on the war through the written word of Wilkie in the Dubuque Herald and the New York Times and through the artist sketches of Simplot in Harper’s Weekly Journal. There is six degrees of separation between (1) Lincoln’s assassination and Henry Rathbone; (2) Rathbone recruiting for the 12th U.S. Infantry; (3) Rathbone’s relationship with Dubuque-connected alumni of Union College; (4) Rathbone and his friendship with Samuel Newbury; (5) Dubuque and the 12th U.S. Infantry recruiting office; and (6) the Dubuque Democratic Herald’s article that collectively connect like pieces of a puzzle showing Rathbone in Dubuque at the start of the war. The question the Dubuque Democratic Herald posed on April 18, 1865 regarding whether or not Captain Henry Rathbone was actually in Dubuque recruiting soldiers in 1861 or 1862, however, is not as evident as the pieces may originally suggest. In May of 1863, the 12th U.S. Infantry was down to four recruiting offices. While its headquarters was located with the regiment in the field, the Twelfth had recruiting offices at Fort Hamilton in New York Harbor, at Elmira, New York and at Philadelphia, Pennsylvania. The Twelfth’s fourth recruiting office was the Dubuque, Iowa office, still in operation since 1861. Once a regiment was staffed and in the field, especially a battle hardened regiment like the 12th U.S. Infantry, a steady flow of new recruits was needed to replenish the ranks. Between death from disease, accidents and being killed in battle; along with getting wounded, sick, captured or made prisoner of war; or because of desertion or end of enlistments, regiments were continually in need of soldiers and therefore recruited new men throughout the war. A Rathbone on Duty in Dubuque? 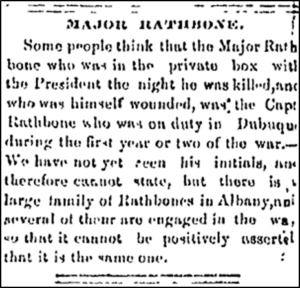 So the question posed by the Dubuque Democratic Herald on April 18, 1865 would suggest that it is possible Captain Henry Rathbone of the 12th U.S. Infantry was in Dubuque in 1861 and-or 1862, helping recruit for the 12th U.S. Infantry. But is it probable? The prior empirical connections mentioned support the possibility, and even lends support to the probability, that Henry Rathbone spent the first year or two of the Civil War in Dubuque. But by no means is it definitive. Rathbone’s military records are short on specifics and do not give any indication that place him in Dubuque, or would have prevented him from having been in Dubuque in 1861 or early 1862. The records are vague regarding where he served while on recruiting duty, but they do clearly state Henry Rathbone joined the 12th U.S. Infantry on May 14, 1861 and served as a recruiting officer from that May until March of 1862. This time period falls within the period the Dubuque Democratic Herald suggested Rathbone might have been in Dubuque, as well as the timeframe we know his classmate Samuel Newbury was active in Dubuque recruiting for the 12th U.S. Infantry. A May 1863 article in the Philadelphia Inquirer entitled “The Regular Recruiting Service” discussed the status and location of each of the nineteen regular U.S. Army infantry units, their headquarters, and the location of their recruiting offices and the names of their recruiting officers. The 12th U.S. Infantry listed a total of nine recruiting officers located at Fort Hamilton in New York Harbor; Elmira, New York; Philadelphia, Pennsylvania; and Dubuque, Iowa. Fort Hamilton had six recruiting officers assigned. Elmira, Philadelphia and Dubuque each had one recruiting officer assigned in May of 1863. Dubuque’s recruiting officer was listed as Captain Rathbone – Captain Joel H. Rathbone. Joel H. Rathbone joined the 12th U.S. Infantry in February of 1862 after resigning from the U.S. Navy in January of that same year. Joel Rathbone had served in the Navy since October of 1858. His first and last assignment in the 12th U.S. Infantry was as a recruiting officer. It is not clear when Captain Rathbone was first assigned to the recruiting office in Dubuque, but it is clear he served in Dubuque until taking command of one of the companies in the 12th U.S. Infantry in June of 1863, when he joined his nephew Henry Rathbone in the field just in time for the Battle of Gettysburg in July 1863. Joel Rathbone was the much younger brother of Henry Rathbone’s father, Jared Rathbone. It is unclear if Joel Rathbone was sent to Dubuque to replace Samuel Newbury as recruiting officer, or if the two served together recruiting in Dubuque. Letters between Samuel Newbury’s sisters Mary Adams and Frances Bagley, of Detroit, in 1861 and 1862, suggest that sometime between October and November of 1861 Samuel Newbury arrived in Dubuque. Letters also suggest Newbury had “assistants” – plural – helping him recruit, which was not uncommon. The sisters’ correspondence showed Samuel Newbury still in Dubuque on April 27, 1862. It is likely Newbury left Dubuque to join the 12th U.S. Infantry in the field when he received his promotion to Captain on July 21, 1862. It is also likely Joel Rathbone was assign to the Dubuque recruiting office shortly after joining the regiment in 1862, serving in Dubuque until June of 1863. Does this mean the Captain Rathbone the Dubuque Democratic Herald was referring to was Joel Rathbone, Henry Rathbone’s uncle? Or could both Rathbones have served in Dubuque? It is clear Joel Rathbone is at least one Rathbone from Albany serving in Dubuque in 1862-63. The Herald article, however, suggested its Rathbone served in Dubuque in 1861-62. Is it possible both Henry and Joel Rathbone spent time in Dubuque recruiting for the 12th U.S. Infantry? It seems possible, although seemingly less probable. Does this second clue suggest the Rathbone in question was in Dubuque the first year of the war, and possibly the second year too? Or is it suggesting the Rathbone in question was in Dubuque the first year of the war, or during the second year of the war? Regardless, Joel Rathbone was on duty in Dubuque sometime between March and June of 1862, until June of 1863, during the second and third years of the war. It is very well possible that both Captain Henry Rathbone, and his uncle Captain Joel Rathbone were in Dubuque related to recruiting efforts for the 12th U.S. Infantry at different times during the Civil War. It is also possible the Herald’s article was referring to Henry Rathbone based on people who knew him when he was in Dubuque. Perhaps Dubuque residents Mary Newbury Adams and her husband Austin Adams were “some people” questioning whether the Major Rathbone was one and the same Rathbone as the one serving in Dubuque with Mary’s brother, Samuel – a college classmate of Henry Rathbone. If Rathbone was in Dubuque when Newbury was, he could have been introduced to Mary and Austin Adams by Samuel. And that could be why “some people think” it was Captain Henry Rathbone on duty in Dubuque and in the President’s box. Samuel Newbury never got to speak about his relationship with his comrade who accompanied Mr. and Mrs. Lincoln to Ford’s Theater that fateful night in 1865. Captain Newbury was killed by a Confederate at Weldon Railroad, Virginia on August 19, 1864. It does not appear that the Dubuque Democratic Herald ever followed up on their April 18th article on Major Rathbone with another article answering the question posed. Perhaps that was because Henry Rathbone was not on duty in Dubuque at the beginning of the war?! The only Rathbone to appear in the military record connected with recruiting for the 12th U.S. Infantry in Dubuque, Iowa is Captain Joel Rathbone. Although this does not rule out Henry Rathbone from also recruiting in Dubuque at the beginning of the war, it does make it less likely. 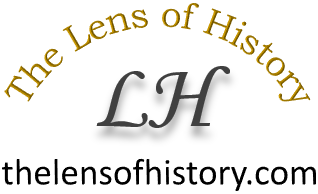 Copyright – 2018 – The Lens of History – John T. Pregler. This story cannot be published, broadcast, rewritten or distributed without prior authorization from the author or The Lens of History. Posted in: Biography, Civil War, Dubuque, Military Filed under: 12th U.S. Infantry, 13th U.S. Infantry, Dubuque, Henry Reed Rathbone, Samuel S. Newbury Jr.